The RHS presents this inspiring garden to highlight the launch of the recent RHS report, ‘Gardening in a changing climate’. The Garden for a Changing Climate, created in partnership by Dr Eleanor Webster; RHS Climate Scientist, Andy Clayden and Dr Ross Cameron, features a conventional garden of today built alongside a garden set 100 years in the future. This enables visitors to see the information highlighted in the RHS 'Gardening in a changing climate' report, produced in collaboration with researchers from the University of Sheffield and the University of Reading by Dr Webster, brought to life. It gives ideas about future planting and design, which are further explained by Dr Webster in the video above. Changes in climate could make our weather warmer and slightly more turbulent in the coming years. When designing the garden for the future, resilience was a key theme the designers explored within the planting and physical structures. Plants that are resilient and can cope with extremes of weather whilst being functional, providing shade, capturing storm water and filtering water throughout the garden could be key. A canopy could quickly be erected to provide shelter in the event of an un-anticipated downpour. This could also capture rainwater and direct it to storage tanks/ponds that can be used in times of drought. Solar fabrics may also enable the same canopy to convert energy from the sun to pump water through the garden or recharge an electric vehicle. Recycled aggregates and a porous pavement replace the traditional impermeable patio and tarmacked parking bay, directing water to a shared community wetland. 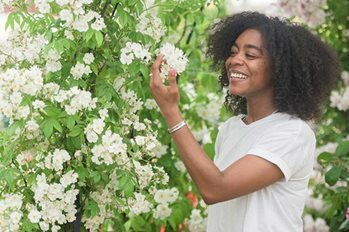 The garden brings to life some of the concepts explored in the RHS Gardening in a Changing Climate report that was launched in April 2017. RHS Climate Scientist Dr Eleanor Webster was lead author on the report. Andy Clayden is a Landscape Architect and Senior Lecturer at Sheffield University, Department of Landscape (see photo, below left). Dr Ross Cameron is a plant scientist specialising in the use of ornamental landscape plants. Dr Eleanor Webster is an environmental scientist at the RHS and specialises in the role of green space in climate change adaptation and mitigation (see photo, below right).